Houses & Homes VA: Meet Susannah Jones – She’s 116 Years Young! Meet Susannah Jones – She’s 116 Years Young! We all hope to live a long and happy life but who would expect to make it to the grand ole’ age of 116? There are only 2 people in the world that were born in the 1800’s and are still alive today and Susannah Mushatt Jones is one of them. 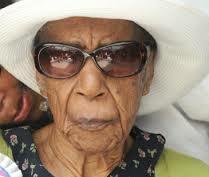 She is the official world’s oldest living person and was born on July 6, 1899. At that time the Spanish-American war had just ended and the president of the United States was William McKinley. She had 10 brothers and sisters and her father was a cotton picker in Alabama. After finishing high school Ms. Jones worked in the fields with her father for a time but eventually moved to New York and found work as a nanny during the 1920’s. It’s amazing if you realize all that she has seen in her long life; 2 world wars, the entire civil rights movement and the development of technology that we today take for granted. The only medication that Ms. Requires is for high blood pressure although, unfortunately, she lost her eyesight about 15 years ago. She is in remarkable condition considering her age and only visits a doctor 3 times a year. So what’s her secret for living so long? Eggs, bacon and sleep! Yep, according to Ms. Jones she enjoys eggs and bacon every morning and there is even a sign on her kitchen wall that reads "Bacon makes everything better". Who can disagree with that? I suspect the fact she never smoked or drank also has something to do with her amazing longevity. Although she never had any children, Ms. Jones spent her 116th birthday with some of her 100+ nieces and nephews. As amazing as she is she is not the oldest person to ever live. Than honor goes to French woman Jeanne Calment. She lived to be 122 years and 164 days old according to Guinness World Records. I wonder if she ate bacon?